GAMMERA THE INVINCIBLE (1966) Brian Donlevy, Albert Dekker, Diane Findlay. Later Gammera films were pretty bad, but this first one was good. A giant fire-breathing turtle-like dinosaur ravages Japan. Climax contains one of the most unique ways ever devised to get rid of a monster. OK special effects. And truthfully, the added American footage isan’t all that bad. 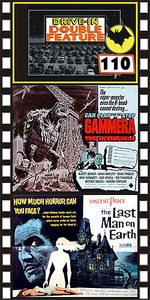 Plus: LAST MAN ON EARTH (1964) Vincent Price, Franca Bettola, Emma Daniell. Top notch science fiction. A plague has killed off most of the earth's population and Price is the sole survivor. The other inhabitants are mutant vampires that Price stakes by day and battles each night. Compelling and chilling sci-fi. A big fan favorite for many years. From 35mm.